Since the iron just has to be barely warm…it’s been hours of entertainment for my kids. If I press too hard (like I did on the line above) I can see a small indentation line after I’ve ironed the pen away…but it goes away after a few minutes. Fun huh? Note: Lots of you said that the ink comes back after it’s exposed to cold. So I guess don’t use these anywhere that will be visible…but for marking lines to make triangles, etc. they are awesome! We sell them at my work and they're the best things ever. I gave a couple of them to a friend for X'mas and she shares our enthusiasm! I never ssee this before, thanks for sharing. 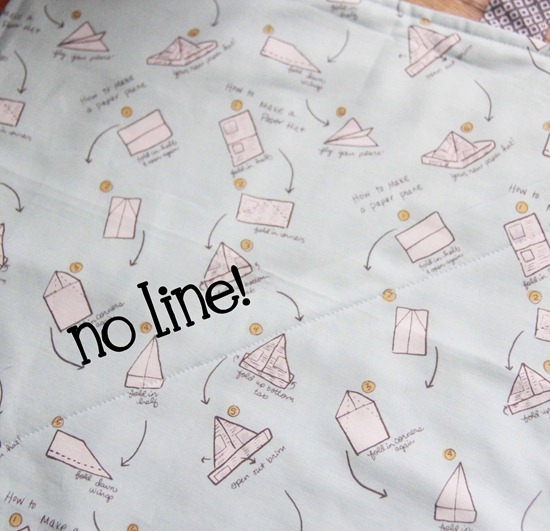 BTW I love the fabric you use for the demo. When I first discovered these pens I fell in LOVE!!!! Then I discovered that the marks will fully reappear if the quilt gets cold…for example sent through the mail in the winter, left in a cold car. Now I use it with much more caution, stopping to consider how the item will be used before marking. Also discovered that on dark fabrics, the pen tends to leave a permanent white mark after the ink is heated away. oh i love love love mine! they are the best! they had them on sale at office max in twin falls a few weeks ago. the three pack was only $5~! They're the "next gen" erasable pen… the ink is friction-heated. After you write on paper, you rub that little rubber bit on the cap over writing and the ink will "erase". But as Marcia said, the color change reverses if you stick the ink in the freezer! I've been looking for something like this. (I just posted pics of two quilts I finished where I REALLY needed these.) Thank you for showing us these. I so need one of these! My "disappearing" marker actually comes back when you iron it. So silly! Lol, I love the pack I have of them. Just wish there was one that showed up on black – hmph! the best part about these pens is that you can get them at most big stationary stores. Well, in Canada you can. They also have highlighters which are divine. Thank you so much for telling us about these pens. 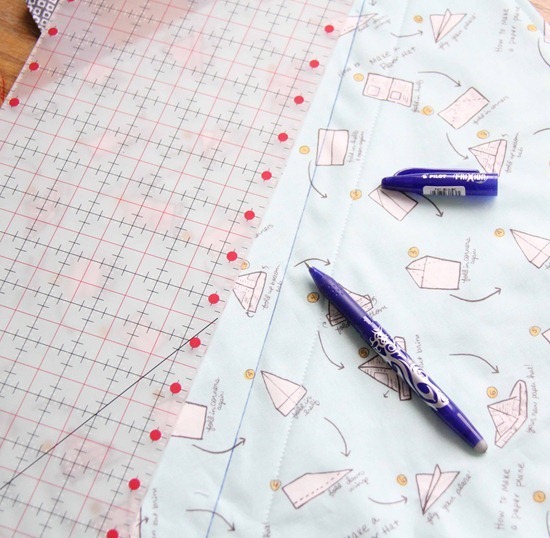 I want to do some line quilting by hand and I was trying to figure out how I was going to do that. The Amazon set doesn't say anything about the lines erasing with the heat of an iron, so I'm very thankful that you told us that. Whoo Hoo, I'm going to order a set from FQS. 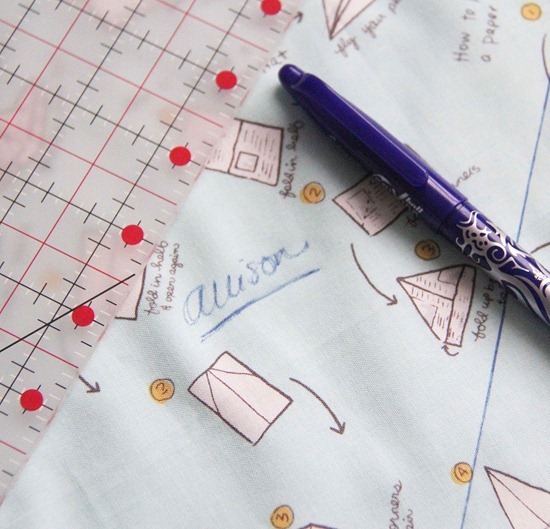 They are brilliant … I discovered them because I'm a teacher and they're jolly useful for rubbing out incorrect percentage marks *ahem ..
… next I'm going to try them for quilting … woohoo! wow! Thanks for sharing! I really need to get this for sure! I was really excited about these until I started poking around. I read that the ink can stay in the fabric even after washing, and the marks can come back if the item is exposed to cold. One blogger did a test with various quilt sandwiches and posted the results – not so hot – and of course I can't find it now. Also, someone on another blog mentioned that the ink is not archival so there's no way to know what will happen with time. I would be really hesitant to use these on a visible part of anything that I wanted to last for years. Oooo those look really awesome. I haven't seen those before! What is the way fun fabric you're using??? Be careful using them on dark fabrics. I've read reports of the pen leaving bleached out lines for some people and the lines didn't come out in the wash. I keep using them on darks, I'm hand quilting and the line is not that visible, I guess you have to test you fabric before and see if you like it or not. Je les utilise aussi et c'est extra ! I love these pens and have them in about 6 different colors. They are amazing! I used one on a baby quilt and it worked great. The lady at the quilt store said the line would only reappear if it was exposed to below freezing temps. and then you could iron it again and it would disappear. I did an experiment with them. Marked a piece of fabric and put it in the fridge ~ it didn't come back. Put it in the freezer and it did. So, don't put your quilt in the snow! I've been using them for a while now (I live in Portland, OR) and everything I've done with them seem to be just fine! I have one as well and love it! I love it! You can also use a blow dryer to "erase" the mark. I was excited to read "YC's" reply above about using the little rubber part on the cap to erase the mark. Just tried it on some paper and it worked! YAY! My Son's 7th grade teacher recommended these to his students. My Son loved them at first but just like any other 12 year old he decided to try something else. I use his left over pens to mark embroidery patterns. I stitch right on the line so I don't worry too much about it. I’m trying to help my friend win the American Family Go Get Your Dream contest. Thank you! It's one of my favorite new tools, too. After we picked some up at our local Shop Hop last year, my Mom decided to blow my 8 year old's mind by writing him a secret message on some old muslin, ironing it away, and instructing him to put it in the freezer to retrieve the message. He kept checking it every few hours, but it took a full 12 hours for the writing to reappear. Boy did he think she was magic! When I purchased mine, I was told the temperature needs to be -120F for the mark to come back. Don't think I will have this problem in Georgia. I love finding new tools of the trade. I have been concidering one of those 'chalk' pens you can buy- they are really expensive but have lots of coloured 'leads' for the pencil. This however might be a better plan… also the crayola washable inks might also be a first plan… thanks for the tips ladies! I just bought one of those when I was at the quilt store on Saturday…I love it!!!! MIne is purple. that's awesome! I'm always looking for a good marking pen! Thanks for showing this! Last week I was asking around about a good disappearing ink marker- I didn't get any good answers. This is exactly what I was looking for! Thank you for posting this. Yes!!!! I need these…like 100 of them! I'm kind of waiting to use them until there is more info/testing. If the marks reappear when the item is cold, I'm thinking that means that the chemicals have not left, but just changed it's form. What if in, say, 5-10 years down the road, the line wears thru the fibers it's written on? I dunno, just a thought. Thanks for the tip! I will definitely give them a try. Do you know if the ink will ever appear again? I was reading a book about hand quilting and she said some inks can show up again. I bought these awhile back at Mary Maxims and love them. I like the fine line and that you don't have to go over and over the same area like you do with some pens. But the thing about the cold surprised me. Had not heard that so put it to the test in the freezer. My scribbling did come back but not as dark as the original. Am going to wash it next and throw it back in the freezer to see what happens. Anybody else do this yet? Still love the pen tho, just a bit cautious as to where I use it.